The second pump is the air conditioning compressor , do with it what you want although there may be uses for the electronic/ magnetic clutch on the pulley. Re the hydraulic cooling fan which is the pump no 1, I believe they were standard on far east Lexi and I have never seen one on a European model though I could well be wrong. On UK spec cars the viscous coupling for the large cooling fan at the rear of the radiator was on the front of the large idler pulley that was fitted in place of the hydraulic fan motor used in other markets. I simply remove the large fan and run the idler. I need this as I also run a power steering pump in the position formerly occupied by the ac compressor. This enables me to run a shorter belt once I have reworked the automatic belt tensioner to operate in the opposite plane it was originally designed to operate in. A far simpler option, and one I wish I had thought of, would be to remove all the idlers and pulleys you do not need ( remembering to keep one so that the belt gets adequate wrap around the main crank pulley) which should leave you with a far shorter belt, an alternator pulley and a power steering pulley. You can then adapt the alternator so that it is not fixed in position but can swivel thus applying tension to the belt. Thus a simple locking nut on a slotted bar ( or a double roise jointed locking bar for the wealthy amongst us) can then be used to lock the alternator into position to keep the required belt tension. Although mine looks OEM I have three idlers, one a tension idler, whilst I reckon I should only need one if using the swivelling alternator solution. Again thank you, much appreciated. It is like going back to school, which is a salutary experience after having learnt so much about the Rover engine! I am intrigued by the name, and use of, the "hydraulic cooling fan"? Was it simply a pump to provide hydraulic pressure to drive a cooling fan? - seems a bit over complicated, but why would that be a surprise on this engine!? Or would it originally have had a fan on the front of the pulley. Is Simon correct that the pump can not be left in place just to act as an idler if required? "There are some distinct advantages, though: The decoupling, as it were, of the fan from the engine gives the developers some leeway in term of radiator and accessory placement. The hydraulic drive can draw more power from the engine than an electric fan, and thus move more air through the radiator for more effective cooling. And compared to a directly-driven unit, the hydro fan’s speed isn’t dependent on engine speed—the solenoid that controls the flow of hydraulic fluid through the fan motor can opt to run the fan on high speed as the engine idles, for example, or completely freewheel the fan on the highway." Last edited by mrkawamackie; 18-10-18 at 06:57 AM. To correct the misinformation i put above about the hydraulic fan pulley needing power steering fluid, a knowledgable person on the 1uzfe swaps fb recently wrote "it's a closed system. Those pipes are connected to the hydraulic fan. It uses its own fluid. As above, most people just remove it. Whatever you do, don't just run it dry, it'll seize". 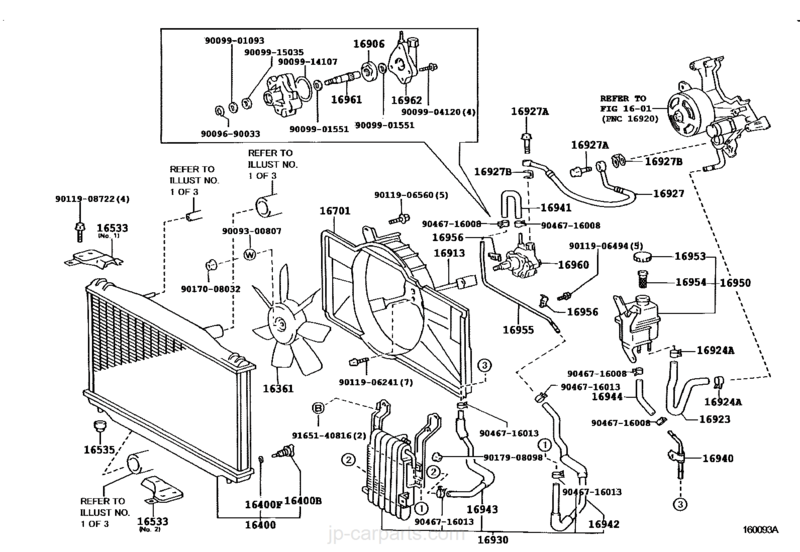 This makes sense as on the parts diagram i linked to above it has its own reservoir. Those who remove it either replace it with the non hydraulic version or they make a blanking plate shaped to fit the gap and have no pulley at all. Everyday is a school day!!! It is slowly becoming clearer, this engine is a constant source of surprise and fond memories of the venerable Rover V8 are already fading. Re Supercharger a secondhand Jag XKR Supercharger with its intergrated chargecooler sits nicely in the V atop a readily available or self-bodgeable inlet manifold. It has been done many times. Lots of info on the net. Larger Mazda 440cc iirc rotary injectors are a direct plug and play option for increased fuel delivery with standard injector harness. The fact that there is zero valve overlap makes this engine particularly easy to add FI. The thermostat inlet housing does get in the way of the supercharger belt path but its no biggy getting a different cover or getting one made/ welded together. The Lexus standard one is plastic so you will need to look elsewhere for a metal donor. Going aftermarket ECU try to use the standard knock sensors in the valley of the V. They are free and an excellent safety feature when tuning . I am learning all the time and enjoying the process, still very much in the fact gathering mode at the moment to try to evaluate the options. Although no firm decisions have been made it looks like twin turbos may have some benefits over a supercharger although the Jaguar unit certainly sounds interesting. Either way I am wondering whether the 10:1 CR of the 1UZ may be limiting factor in either case. I am currently reading the science behind the impact of boost on Effective Compression Ratio to see if it would be necessary to lower the CR in order to fit forced injection to the engine. I am looking at the Link ECU which can be supplied already mapped for "standard" 1UZ, I believe it is from New Zealand where, like Australia, there is a healthy JDM tuning market. I think the thermostat housing on my engine is metal, but that is just from memory of when I took it off as I have not had a chance to check. The engine number, which I found this morning (with Paul's help), is 0176608 so I think it is a fairly early engine. I am hoping to keep as much of the original items as I can so the knock sensors are safe and, as you say, a good safety feature.